The purpose of this assessment probe is to find out students’ ideas about conservation of matter using ordinary objects such as a cookie. The probe is specifically designed to find out whether students believe there will be a change in weight when a whole object is broken up into many small pieces. This probe is a great way to determine what students understand about the conservation of mass. The best part is that Page helps you figure out what you shoud do next in your instruction. Great formative assessment. 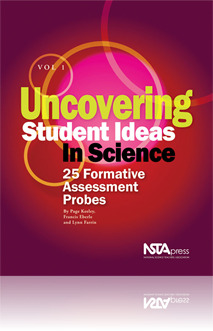 Outstanding information can be gained as you administer this probe to your 3rd-6th graders. Possibly 7/8th use for ESL or Special Needs students. Will cover conversation of mass along with view on pebbles/rocks/boulders. I'm never disappointed in the information I gain as an educator on my students' insights and misconceptions.